Triton is the largest of Neptune's moons, whose unusual orbital characteristics suggest that it formed elsewhere in the solar system and was later captured by Neptune. Triton was named after a merman in Greek mythology who was the son of the sea god Poseidon (the Roman god Neptune). Triton is unique among the large moons of the solar system in that it moves in a retrograde orbit—i.e., one that is opposite the direction of Neptune's rotation. Its mean orbital distance is about 354,800 km (220,500 miles) from the planet. Also unusual for a large moon is Triton's orbital inclination—the plane of its orbit is tilted more than 157° to Neptune's equator. (The orbits of the other large moons in the solar system are inclined less than about 5° to their planet's equator.) Triton rotates once on its axis every 5.877 days, which is the same time that it takes to revolve around Neptune. As a result of this synchronous rotation, the moon always keeps the same face toward Neptune and leads with the same face in its orbit. Each of Triton's seasons, like those of Neptune, lasts nearly 41 years, or one-fourth of Neptune's orbital period. 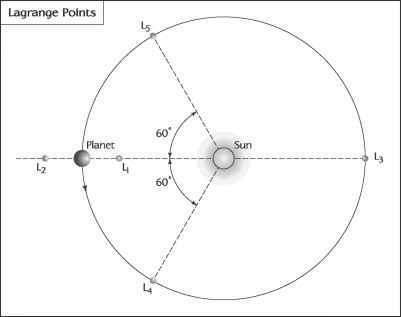 Triton's orbital tilt and its axial tilt of 30° with respect to Neptune's orbit combine in such a way that the moon's poles alternately point toward the Sun, much like the case of Uranus. surface, which is devoid of water and other volatile components (with the exception of what is interpreted as water ice on the floors of craters near its poles). Triton's low mass is likely a consequence of a predominantly water-ice interior surrounding a denser rocky core. Nevertheless, its mean density of 2.06 g/cm3 (1.19 oz/in3) is higher than that measured for any of the satellites of Saturn or Uranus and is surpassed among large satellites only by the Moon and Jupiter's Io and Europa. Triton is similar in size, density, and surface composition to the dwarf planet Pluto. Its highly inclined, retrograde orbit suggests that it is a captured object, which perhaps formed originally, like Pluto, as an independent icy planetesimal in the outer solar system. At some point in Neptune's early history, Triton's orbit around the Sun may have carried it too near the giant planet. Gas drag in Neptune's extended atmosphere or a collision with an existing moon of Neptune slowed Triton enough to place it in an elongated orbit, which was also retrograde and highly inclined. Tidal interactions between Triton and Neptune—cyclic deformations in each body caused by the gravitational attraction of the other—eventually would have reshaped its path around Neptune into a circle. The process of Triton's capture and circularization of its orbit would have severely disrupted any previously existing system of moons that had formed along with Neptune from a disk of proto-planetary material. Nereid's radical orbit may be one consequence of this process (although the possibility that Nereid too is a captured object has not been ruled out). 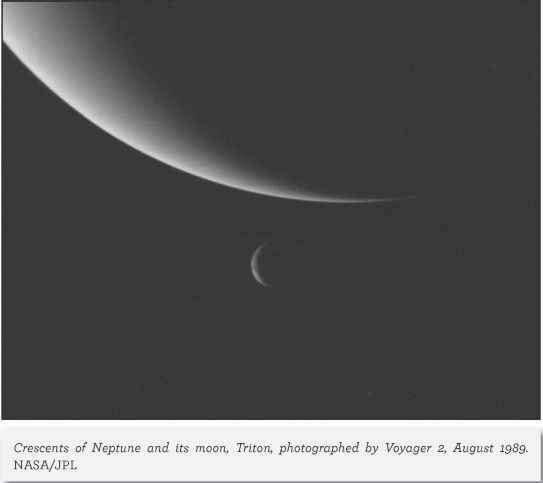 Moons that were in orbit between Proteus and Nereid would have been ejected from the Neptunian system, thrown into Neptune itself, or absorbed by the molten Triton. Even those moons orbiting closer to Neptune would not have escaped some disruption. The present orbits of Naiad through Proteus are probably very different from their original orbits, and these moons may be only fragments of the original bodies that formed with Neptune. Subsequent bombardment by Neptune-orbiting debris and by meteoroids from interplanetary space may have further altered their sizes, shapes, and orbits. Triton's visible surface is covered by methane and nitrogen ices. Spectroscopic studies from Earth also reveal evidence of trace amounts of carbon monoxide and carbon dioxide ices. Even at the remarkably low surface temperature of 38 K (-390 °F, -235 °C) measured by Voyager, a sufficient amount of frozen nitrogen sublimes (passes from a solid directly to a gas) to form a tenuous atmosphere having a near-surface pressure less than 0.00002 bar. During the Voyager flyby, a polar ice cap presumably composed of nitrogen ice deposited the prior winter covered most of Triton's southern hemisphere. At that time Triton was nearly three-fourths of the way through its 41-year southern springtime. Equatorward of the polar cap, much of the terrain had the appearance of a cantaloupe rind, consisting of dimples crisscrossed with a network of fractures. Near the equator on the Neptune-facing side of Triton exist at least two, and perhaps several, frozen lakelike features with terraced edges. The terracing is probably the result of multiple epochs of melting, each successive melt involving a somewhat smaller patch of ice. Some of the terrace cliffs rise more than 1 km (0.6 mile) high. Even at Triton's low surface temperature, nitrogen or methane ice is not strong enough to support structures of that height without slumping. Scientists assume that the underlying material in these structures is water ice, which is much more rocklike at low temperatures, although no direct evidence for it is seen in Triton's spectra. A thin veneer of nitrogen or methane ice could effectively hide the spectral signature of water ice. The process from capture to circular orbit may have taken more than one billion years, during which time the enormous tidal deformations experienced by Triton most likely melted its entire interior. The molten body would have undergone differentiation, the denser material sinking into a core region and the more-volatile materials rising to the surface. It is thought that Triton's surface cooled faster than its interior and formed a thick outer layer of predominantly water ice.